Is fear still the ruler of the day? Has the Fear the Walking Dead TV show been cancelled or renewed for a fifth season on AMC? The television vulture is watching all the latest cancellation and renewal news, so this page is the place to track the status of Fear the Walking Dead, season five. Bookmark it, or subscribe for the latest updates. Remember, the television vulture is watching your shows. Are you? An AMC horror drama, Fear the Walking Dead stars Kim Dickens, Frank Dillane, Alycia Debnam-Carey, Rubén Blades, Danay Garcia, and Colman Domingo. 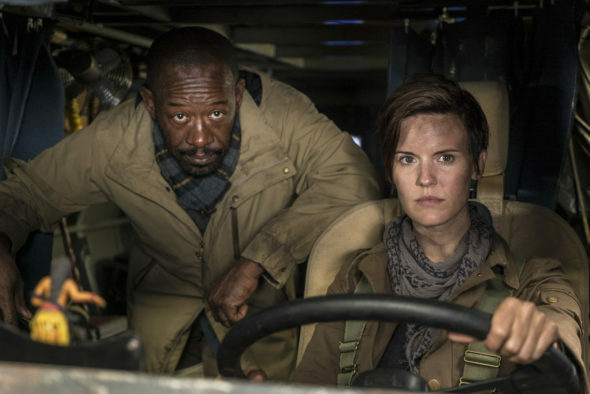 In the fourth season, The Walking Dead‘s Lennie James brings his Morgan Jones character to the prequel series, as the recent past merges into the present struggle. While encountering new friends and enemies, the crew will fight for and with each other, as well as against the dead. Also joining in season four are Maggie Grace, Garret Dillahunt, Jenna Elfman, Kevin Zegers, and Evan Gamble. The fourth season of Fear the Walking Dead averaged a 0.78 rating in the 18-49 demographic and 2.27 million viewers. Compared to season three, that’s down by 11% in the demo and down by 4% in viewership. Learn how Fear the Walking Dead stacks up against other AMC TV shows. On July 28, 2018, Fear the Walking Dead was renewed for a fifth season which will debut June 2, 2019. Will it be the final one? Stay tuned for further updates. Will AMC cancel or renew Fear the Walking Dead for season five? Though the ratings are much lower than The Walking Dead’s, Fear remains the cable channel’s second-highest rated series. I don’t see it being cancelled for awhile. For now, I’ll keep a hungry eye on the ratings and update this page with breaking developments. Subscribe for free Fear the Walking Dead cancellation or renewal alerts. 7/29/2018 Status Update: Fear the Walking Dead has been renewed through season five on AMC. Details here. TV show ratings are still important. Follow Fear the Walking Dead‘s weekly ups and downs. Find more Fear the Walking Dead TV series news or other AMC TV show news. What do you think? Did you expect AMC to renew the Fear the Walking Dead TV show for season five? How would you feel, had AMC cancelled this TV series, instead? No cancelen!! No manches!! These shows are bomb. Family entertainment good. Me and my family are ready for an apocalypse thanx to these shows. I would have died trying to take a walker out by shoving a wooden steak through it’s heart or trying to kill it with a silver bullet. We are now well informed and well prepared to survive this and more. My 12+ years as a Marine could never have trained me for something like this. Be Dumb Not to Renew good actors, good show. Now as it stands character growth has just started. I would be very disappointed if Fear the walking dead is cancelled! My family enjoys this show. The seasons for both Deads are so darned short with so much time in between, I appreciate the crossover to Fear the Walking Dead. Kinda extends the season of both. Love John, The Gunslinger — sincerely hope he lives for a while! Would be disappointing and a lot of fans. For bothFear of The Walking Dead and The Walking Dead. Do not cancel please fear of The Walking Dead season five. I believe that youWould be disappointing and a lot of fans. For both of the series The Walking Dead and the fear of The Walking Dead. I don’t know if anybody knows this but new viewers can actually start from S04 without watching anything came before! It’s a reboot of sorts and the numbers prove it! around 35-40% increase in both total viewers and the key 18-49 demo. So, clearly a lot MORE (NEW) people tuned in! Who knows maybe the ratings will only grow and also it has great scores on RT from both users & critics! So yeah! That’s not true for me I didn’t even know Morgan was in the fear of walking dead. It’s just more entertainment to watch. Since we have to wait a week sometimes a month for a new episode of The Walking Dead to come out. Maybe that’s your opinion about Morgan maybe that’s the reason you watched the fear of The Walking Dead. But you can’t speak for all the fans. RT oh you mean that thing that scored The Last Jedi so well? Lol. And critics give it great reviews every season because they are biased in the tv industry or paid to. Critics reviews do not influence the audience and it is the audience that matters not the critics. Umm..NO! It is actually at its best right now. What you are referring to must have been that way in the past. But from this episode alone, I did not FTWD cringey in any way or any other cheap tricks that you mentioned! Lol Fear cannot hold its own. It needs to steal everything from the main show, even characters in order to survive! Morgan carried this entire episode and boosted ratings. Maggie Grace puts the females in this show to shame. But they are only guest stars and nobody roots for the main cast on Fear or silly storylines. The time jump will be to its detriment. Oh boy I can’t wait to see that heap of trash Fear cancelled so Morgan can get his own show with a better name and no freakshow clark family!! Puhlease Fear is constructed on Cheap everything. Cheap title cheap actors cheap tricks to rope in viewers cheap thrills cheap story cheap dialogue cheap distractions….need I go on? It’s just sad when you actually feel a stronger connection to a video game like The Last of Us than this garbage they call a spin off. Creating Fear has not only ruined Fear, it has ruined TWD because now they are also more limited to what they can do in the main show and they are becoming careless with it as is obvious. just dont watch it!! !we like it!!! but what happened to it??? it just stopped …end of Season?? Please do not cancel this show!!! I thought the two shows were eventually merging. I remember that conversation on Talking Dead. Networks are so quick to pull good shows and we are left hanging. Please don’t cut this show short, give it some time. Kathleen this is season 4….it has had too much time as is and has done FA to become in any way decent viewing. They can just cancel Fear and make another (hopefully better) spin off with characters people actually want to root for. It isn’t good it’s awful. And speaking of which, so is Talking Dead. Milking the cow much? Havana They have already rebooted the show with S04 so I don’t know what you’re talking about. Second, from this episode alone (my first WD episode ever), I found the characters and the show to be something that I can root for in the long run! Lol they did not reboot it. It still stars the same characters we don’t want to root for. A 6 year time jump only makes it more dumb. It still has the same dumb name. You think it’s rebooted just because Morgan carried this episode?! Morgan is only a temporary fixture to try and save Fear’s ratings. It has already been confirmed he will be returning to TWD after this season. Nothing in Fear has changed and nothing will changed. I hope Scott Gimple kills all the main characters off and then cancels it! !